When it comes to improving energy efficiency in your home, it’s well known that things like insulation, quality windows, and proper air sealing are critical. However, one of the most frequently overlooked improvements that can not only help keep your house warm in winter and cool in summer, as well as extend the life of your roof, is proper attic venting. Community Roofing and Restoration is your best bet for attic venting in Milwaukee and surrounding areas. 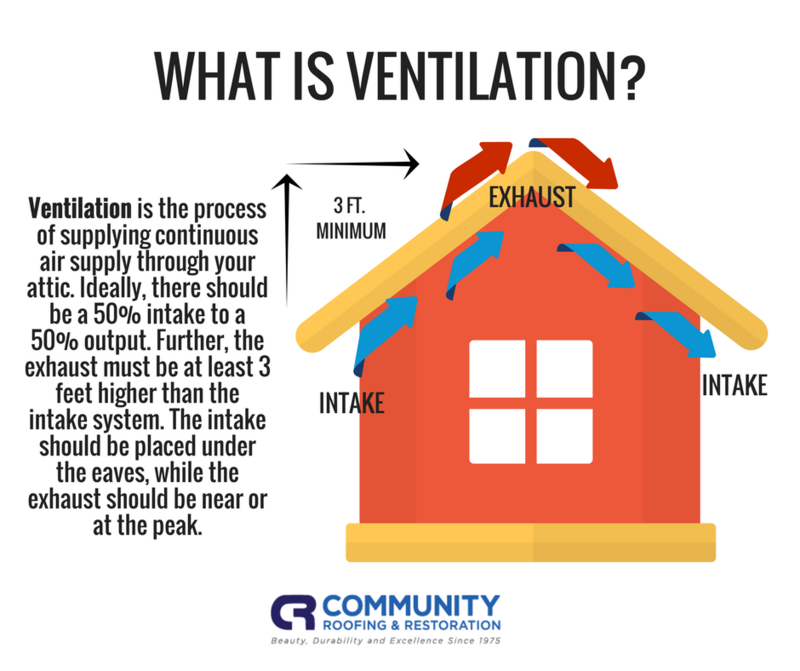 It may seem counterintuitive that proper attic venting can improve energy efficiency, but if your attic venting isn’t functioning correctly, you may be wasting energy and throwing money away. In summer months, a properly functioning attic venting system vents hot air out the top vents and pulls in cool air from the soffit vents. If the soffit vents aren’t moving air properly, your home’s air conditioner may be cooling your attic, causing it to work harder and use more energy. Also, if the roof vents aren’t moving enough air, there may be excess hot air in the attic, causing moisture and damage to your roof. For these reasons, it’s important to keep your attic ventilated in summer. In winter months, it’s of great importance to keep your attic cold. A warm attic means melting ice on your roof, and water infiltration into the shingles. This will certainly cause damage to your roof, and large ice dams can even cause water to enter the living spaces of your house, swelling walls and ruining woodwork. The easiest way to assess your attic’s need for ventilation work is to look for roof vents. If you don’t see any vents on the roof or in the eaves, your attic isn’t properly ventilated. Many roofs have ridge vents at the peak of the roof, which can be hard to see from the ground, but typically vents are easy to identify. In summer, if your ceiling feels hot, you may have a problem with your attic not properly venting hot air. In winter, if you see thick ridges of ice at your eaves, you may have ice damming due to improper venting. Do you feel that your attic may need ventilation work? We’re happy to stop by and assess your attic venting situation, answer all your questions and give you a free quote. Give us a call at 414-332-1139 or fill out our contact form today to schedule your free visit!